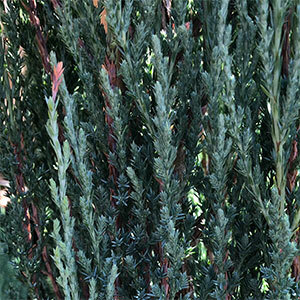 Naturally upright in growth habit, Juniperus scopulorum ‘Blue Arrow’ is a conifer that is an alternative to the common pencil pine. It is a great plant for confines spaces where you wish to add some height, it can also be planted as a screening plant. With such good foliage year round it can also be used as a structural plant. Try it either side of pathway, entrance or as a focal point in the garden. Being very low maintenance it is also well suited to commercial plantings. This is a very easy care plant once established, it requires little to no pruning and is tolerant of a range of soil conditions once established. Plant in a well drained soil in a sunny position. Water through dry periods over the first few summers. Common Name – Blue Arrow Juniper..